An interesting collection including some sugary items including sweets and caramel for coffee. The samphire will be served with the fish no doubt. Salmon, blue cheese, ice cream sauces, sweeties, coffee caramel, + colls?, eye makeup remover, carrots, potatoes, fish, samphire, sauce. 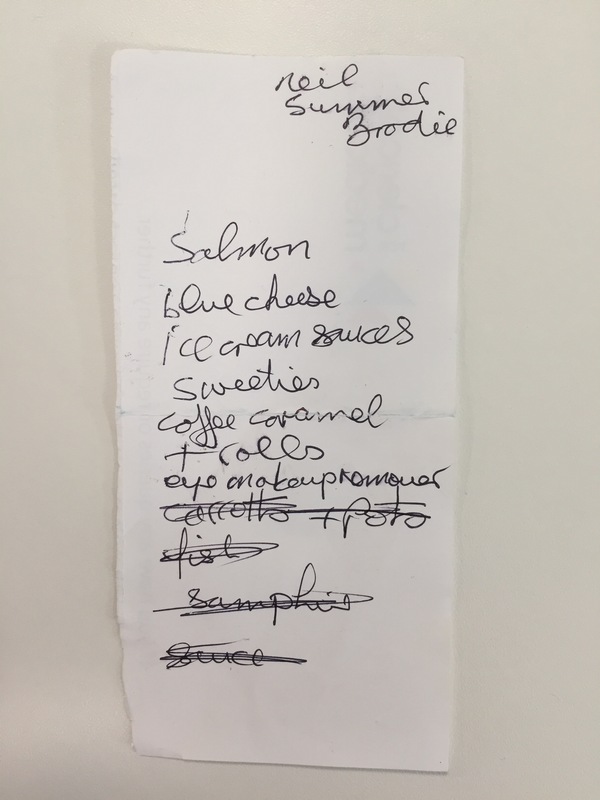 The salmon and blue cheese and ice cream sauces sound festive! Maybe it’s a dinner party list, with the makeup remover tossed in to remind our list maker to take off his/her face after the party? I like this one! That is great! Can you send the image to addresstogiveaway@gmail.com saying when and where the list was found or used? Someone young no doubt – a few names in the top right hand corner that might have allergies or specific diet requirements. they are on their way to type II diabetes with that list!